PRI secured a defense verdict on behalf of an internist/rheumatologist and a nurse practitioner in Queens County Supreme Court in a case involving an allegation of a delayed diagnosis of a subdural hematoma resulting in neurological impairment. The plaintiff was a 45 year old man who received general medical care at the office of the defendant-internist/rheumatologist and defendant-nurse practitioner. Aside from a visit 4 years prior to the incident, the patient was exclusively seen by the nurse practitioner (NP). On December 26th, the patient presented to the office and was seen by the NP. The patient reported a history of loss of consciousness. He claimed that he felt sick with fever and was found lying on the floor by his wife. For the next few days he had a headache, cough, and chest congestion. When his symptoms failed to resolve, he decided to come into the office. The nurse practitioner performed an exam which was positive only for chest congestion. He diagnosed a febrile illness and prescribed antibiotics and supportive care. Five weeks later, the patient returned to the office. He reported that the headache had gone away but returned, noting pounding over both temples. The NP diagnosed a tension headache and chronic sinusitis. Two weeks later, the patient presented to a different practice. The physician ordered a CT scan of the head and sinuses where a large right sided subdural hematoma was diagnosed. The patient underwent neurosurgical evacuation of the hematoma and complained of residual enduring left-sided weakness, marked fatigue and cognitive deficits. Eight months after the surgery, the patient brought suit against the physician and nurse practitioner for failing to diagnose the subdural hematoma in a timely fashion resulting in neurological disability. One area of difficulty in this case surrounded the practice agreement which had been in place between the physician and the nurse practitioner. The agreement stated that the physician would review the progress notes of the nurse practitioner every other day. During deposition, the physician conceded that charts were not reviewed every other day as had been described in the practice agreement. At trial, plaintiff’s counsel attempted to use the fact that the agreement was not followed to show that the internist/rheumatologist had not properly supervised the nurse practitioner’s care of the plaintiff. Furthermore, plaintiff’s counsel produced expert witnesses who claimed that, by the time the patient had arrived in the ED, his clinical picture had become “catastrophic”. Finally, the plaintiff attorney attempted to show through the medical record, and through expert opinion, that the patient had suffered seizures along with cognitive and behavioral deficits following the surgery. 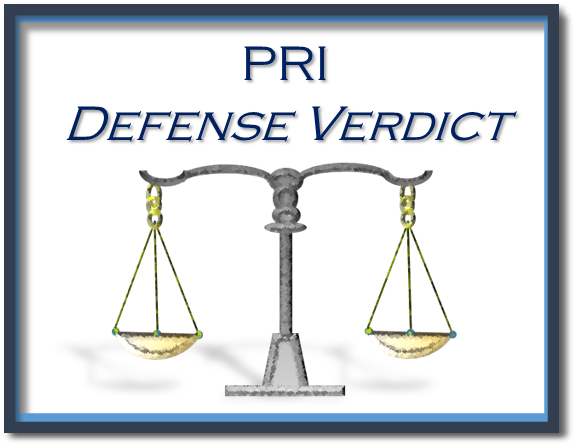 In response the allegations, the PRI defense team was able to show that, no matter what was stated in the practice agreement, the physician was fully compliant with New York State law in his supervision of the nurse practitioner at the time of the allegation. Using a skillful examination of the defense expert and cross-examination of the plaintiff expert neurologist, PRI’s defense counsel was able to show that the failure to obtain a head CT was consistent with the standard of care since the patient had no signs of head trauma and a normal neurological exam. Contrary to the plaintiff’s characterizations, the defense showed that the clinical situation was not catastrophic at the time the patient presented to the ED, and that in fact, the patient did not even undergo neurosurgical evacuation of the subdural hematoma until over 2 days after it was diagnosed. In terms of damages, the defense was able to prove that the patient was non-compliant with his follow-up care and that his alleged neurological issues predated the injury. After hearing testimony from both sides, the jury found that the care of both defendants did not depart from good and accepted medical practice, and a defense verdict was reached.